Come play at the largest miniature golf course facility in the country! The Castles of The World course features a pagoda, castle and Spanish forts with shooting water cannons. The jungle themed course adds a safari and lush tropical feel to your golf experience. Surf’s up is our oceanic and nautical themed course. Come visit and play all of our courses! Note: Golf courses close one hour prior to park closing. 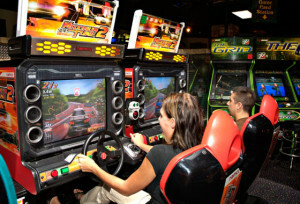 Race against your friends for 6 minutes on our Race Track! Must be 58″ to drive the car, must have a valid license and be at least 18 years old to drive a passenger. 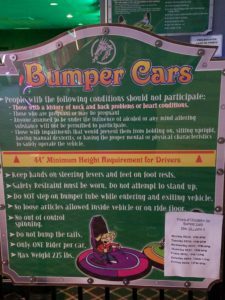 Passengers must be 3 years of age or older, weigh more then 45 lbs, and be at least 40″. NEW at Golfland! 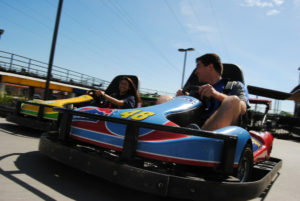 If the raceway is too fast, then try out our bumper boat lagoon. 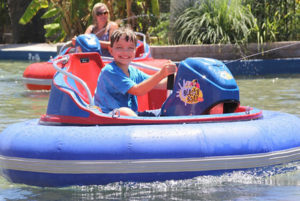 Each bumper boat is equipped with a water jet for MORE FUN! You can bet on getting wet on this attraction! Riders must be at least 44″. Challenge your friends to a fast paced game of Laser Joust. Our 5000 square foot state-of-the-art arena will put your skills to the test. 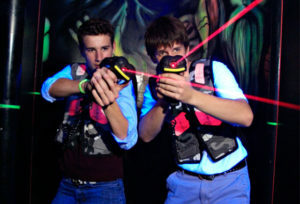 Our laser tag area is great for all types of fun and is a favorite for birthday parties. Laser tag makes a great team building activity for your family or your co-workers. Group rates are available. 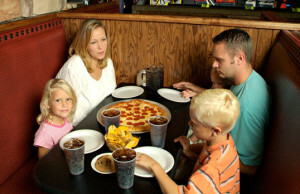 Camelot proudly serves the best pizza and sandwiches in the kingdom! We also have weekday lunch specials if you’re looking for something different than your usual. We also have fresh made-to-order Sub Sandwiches, Nachos, Pretzels, Soft Drinks and Icees. The classic taste of Iceberg Shakes are now available at Golfland. Order your custom shake with hundreds of different flavor combinations.